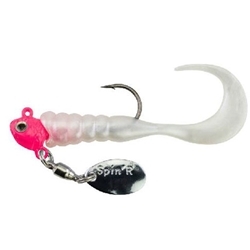 Johnson Crappie Buster Spin'R Grubs are all about action whether the whipping tail of the grub or the vibratory spin of the blade. The "Keeled" head allows the bait to swim at wide range from slow retrieve to faster troll. Indiana blade attached to ball bearing swivel adds both vibration and flash. Has a Grub Tail action ideal for attracting Crappie in all water conditions and can be used for all crappie fishing techniques; Slow trolling (spider rigging), cast and retrieve, and even long line trolling! Comes with 2 extra grubs!